UCLB is pleased to announce that OpSAFE, a new CE marked plugin for touchless control of OsiriX MD will be exhibited at Medica 2014 conference from 12-15 November in Germany. OpSAFE allows medical staff in the operating theatre to use natural hand movements to easily navigate and manipulate medical images, while keeping their gloves sterile. This reduces the risks associated with current practice, while giving the surgeon instant control of the image in the sterile environment when time can be crucial. 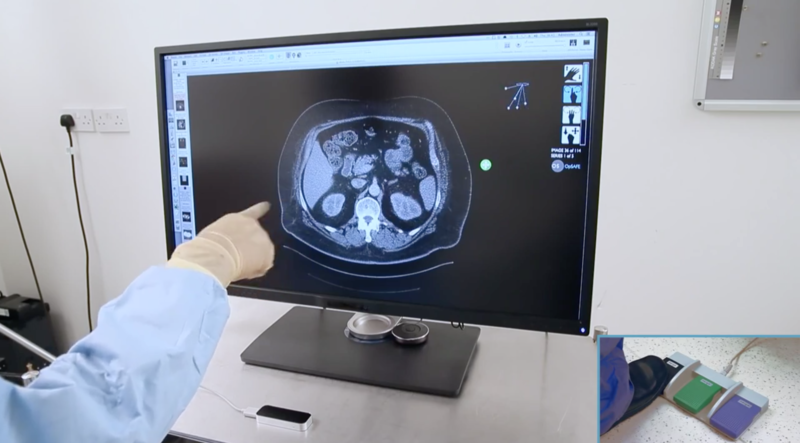 The OsiriX viewer can communicate with the hospital PACS system or directly or with a scanner to allow near real-time retrieval of images. This means that by using OpSAFE, review of fluoroscopy or interventional CT images in the procedure room can be made when they are acquired. The CE marked system will be on show at Medica Dusseldorf (Hall 9 B11) hosted by Medical Device Management, a regulatory and manufacturing company who also manufacture OpSAFE under an exclusive licence for UCLB. OpSAFE is the brainchild of UCL Hospital’s consultant radiologist Navin Ramachandran and has been developed with support from UCL Hospital’s Innovation office and UCLB. The device removes the need for a control station away from the sterile field or for a second staff member having to control the image viewer. UCLH (University College London Hospitals NHS Foundation Trust), situated in the West End of London, is one of the largest NHS trusts in the United Kingdom and provides first-class acute and specialist services. The state-of-the-art University College Hospital which opened in 2005, is the focal point of UCLH alongside five cutting-edge specialist hospitals. UCLH is committed to research and development and forms part of UCL Partners which in March 2009 was officially designated as one of the UK’s first academic health science centres by the Department of Health. UCLH works closely with UCL, translating research into treatments for patients. Visit our website www.uclh.nhs.uk, we are also on Facebook (UCLHNHS), Twitter (@UCLH) and Youtube (UCLHvideo).